A riveting and timely intellectual history of one of our most important capitalist institutions, Harvard Business School, from the bestselling author of The Firm. With The Firm, financial journalist Duff McDonald pulled back the curtain on consulting giant McKinsey & Company. 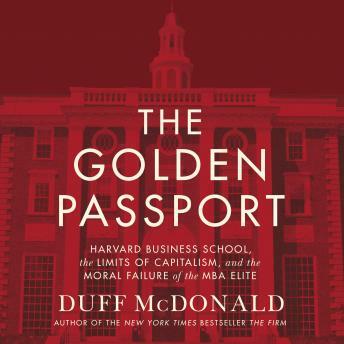 In The Golden Passport, he reveals the inner workings of a singular nexus of power, ambition, and influence: Harvard Business School. Harvard University occupies a unique place in the public’s imagination, but HBS has arguably eclipsed its parent in terms of its influence on modern society. A Harvard degree guarantees respect. An HBS degree is, as the New York Times proclaimed in 1978, 'the golden passport to life in the upper class.' Those holding Harvard MBAs are near-guaranteed entrance into Western capitalism’s most powerful realm—the corner office. Most people have a vague knowledge of the power of the HBS network, but few understand the dynamics that have made HBS an indestructible and powerful force for almost a century. As McDonald explores these dynamics, he also reveals how, despite HBS’s enormous success, it has failed with respect to the stated goal of its founders: 'the multiplication of men who will handle their current business problems in socially constructive ways.' While HBS graduates tend to be very good at whatever they do, that is rarely the doing of good. In addition to teasing out the essence of this exclusive, if not necessarily 'secret' club, McDonald explores two important questions: Has the school failed at reaching the goals it set for itself? And is HBS therefore complicit in the moral failings of Western capitalism? At a time of pronounced economic disparity and political unrest, this hard-hitting yet fair portrait offers a much-needed look at an institution that has a profound influence on the shape of our society and all our lives.